Anthony Brown spoke at the 6.30 pm Mass on the Saturday, and the 8.30 am and 10.30 am Masses on Sunday. See a copy of the talk. St James the Less parishioners were particularly responsive and with well chosen hymns, and well chosen words from the Parish Priest, Canon Tony McBride, the Mass was a clarion call for action. This was a follow on from June 17 (Day for Life – theme: Human Trafficking) and we gave out cards to those who hadn’t received them on the day or who had mislaid them. We also trialled an idea by Meriel Woodward to have parishioners sign a pledge to pray, be aware and act. See a copy of the pledge. We obtained 76 signatures suggesting that there is great potential here to get Catholics to commit to effective action requiring minimal effort. Note the commitment made by senior law enforcement officers from around the world at the first Vatican conference on human trafficking in 2014. Around 20 reps attended the workshop which was an opportunity to talk about trafficking and revisit June 17. A show of hands indicated that most of the reps in the room were from parishes where our initiative had featured in some way. The cards had been distributed according to plan. We put a lot of effort into the build up to June 17 but it is difficult to know how much impact we have had. Without doing a formal evaluation we only have limited information on what actually happened on the day. However, arising from the day, or from communication before it, we have spoken in, or had invitations to speak in, seven Catholic churches, one Baptist church, one charity and a local radio slot. Feedback has been very positive where we have sought it but we need to remember that that is entirely from a small sample of people already committed. Of over 160 churches in the Diocese we have feedback from 17. Did the cards arrive on time? Was it clear what was expected of parishes? 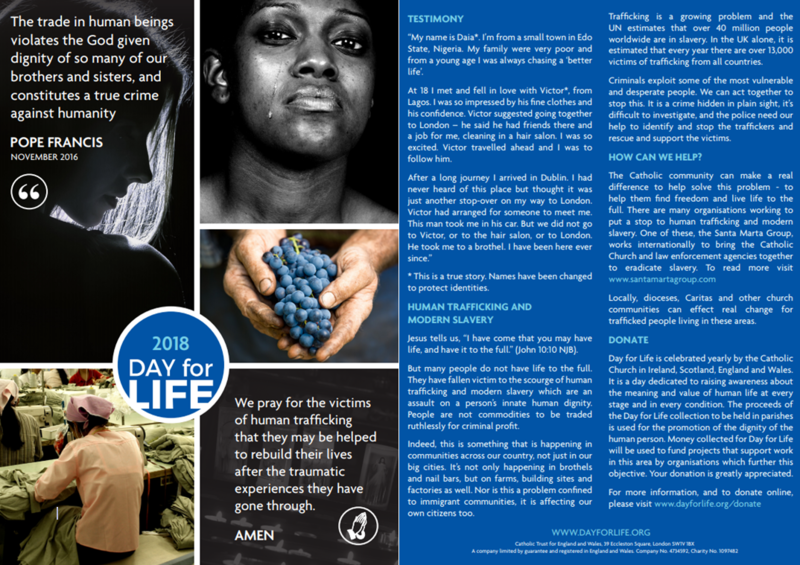 Was it clear that Day for Life this year had the theme of human trafficking? Did prayer and awareness raising feature at Mass? Did parishes succeed in handing cards out to all (or most) Mass attenders? Were there enough cards or too many? The result of that gave a positive indication that the exercise had gone well in eleven churches. The representatives covering five churches did not respond. In other deaneries two people said the day had gone to plan. One of these was particularly positive and had generated interested contacts. Two said they had been away and couldn’t comment. One had little recollection but said that most of the cards remained in the porch. We asked deans to get back from their next deanery meeting which we had assumed would be July but turned out to be September by which time memories and interest may well have faded. For the future we need to build on what we have achieved by keeping the topic live and encouraging people to keep their cards. What seems to be clear is that whilst it is probably the minority that respond to any great extent, there are a number that do so very positively and subsequently engage with others. From experience we know that positive affects only come to light later and sometimes under chance circumstances. We almost certainly impact in ways we will never know. Ten minute talk at Mass at 5.30 on Saturday and 10.30 on Sunday. This arose following a recommendation from someone who had heard Anthony Brown speak on the subject of human trafficking elsewhere. 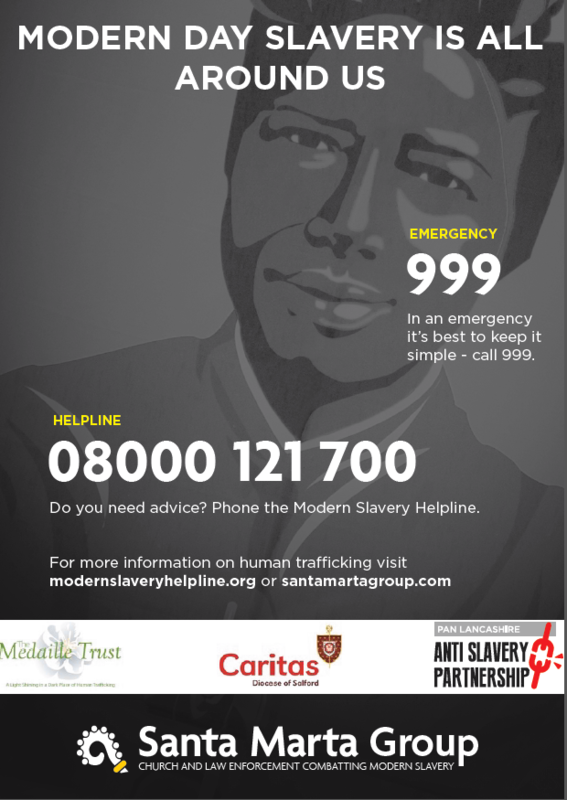 St Aiden’s and St Oswald’s didn’t receive the Caritas Day for Life cards in time for June 17 so we agreed to focus on those and the Caritas/Lancashire Police partnership in raising awareness on human trafficking: Please keep the card with you to remind you to be on the look-out for victims of human trafficking, and to know what to do if you see something. 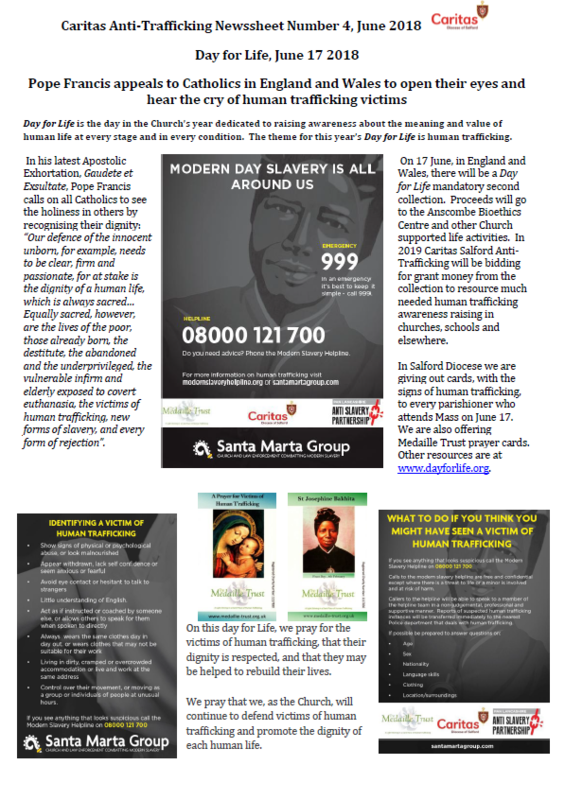 If all the Catholics in Salford Diocese did what I’m asking we would rid the Diocese of human trafficking. Pope Francis wants to rid the world of it by 2025 so let’s help him to do that in Salford Diocese by 2020. 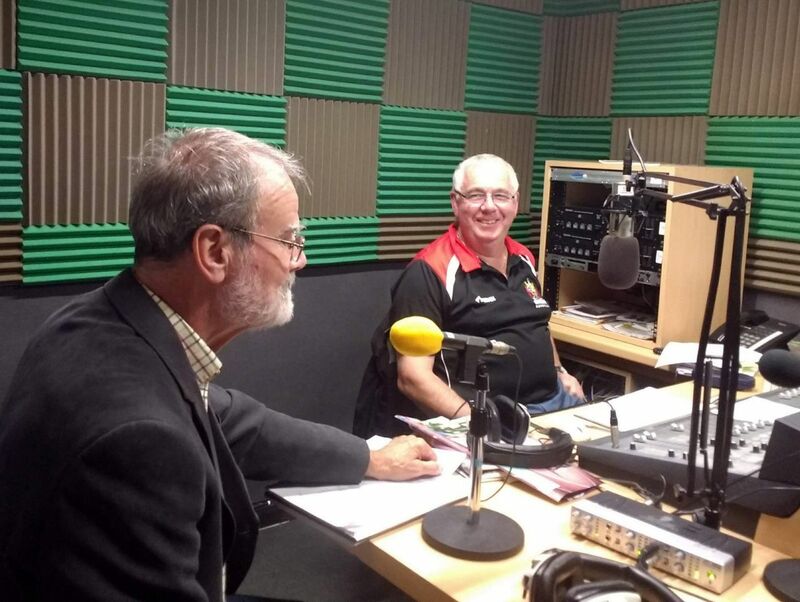 Apart from a very positive response from the Parish which is good for fostering links, we have an invite to speak on Oldham local radio. Concern was expressed by one parishioner after the Saturday night Mass about the appropriateness of the material for children and Fr Stephen gave out a health warning before Sunday Mass. This does raise the issue of how to tackle subjects, which need to be addressed by Catholic congregations, in a way that gives them sufficient substance in an audience which includes young children. It is something we will pursue with Diocesan Safeguarding. 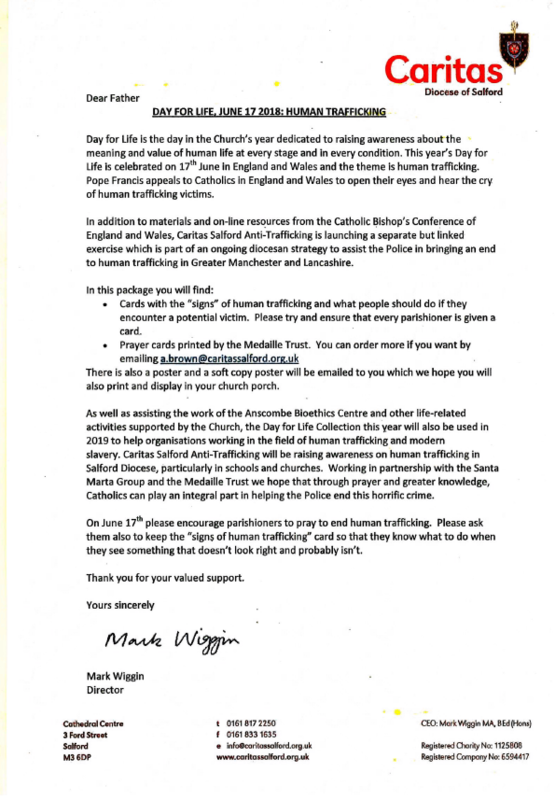 Although this was a Caritas Salford Anti-Trafficking exercise St Aiden’s and St Oswald’s had agreed to give a donation to the Medaille Trust. In the event they doubled it. We don’t know the extent to which Salford Diocese parish priests engaged parishioners is supporting Day for Life but some certainly did. 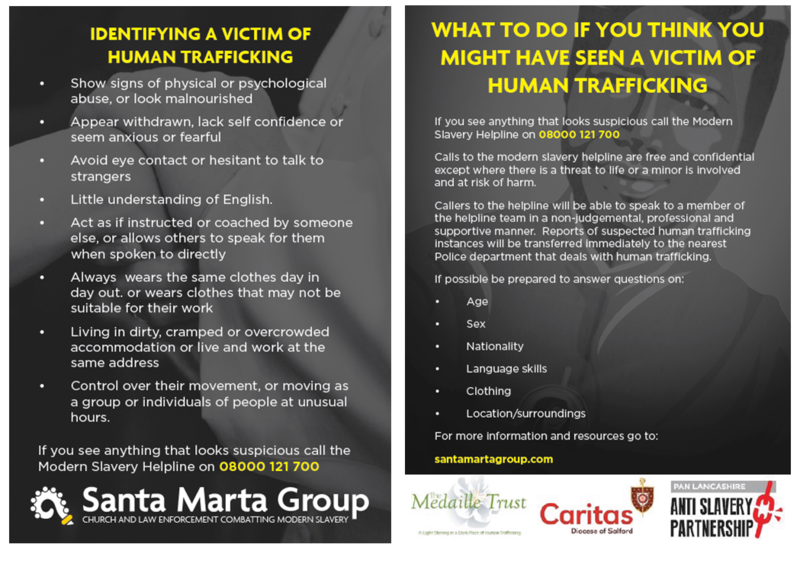 Apart from dealing with posters and giving cards out to parishioners, our supporters in three parishes gave talks at Mass, urging people to note the signs of human trafficking and act. Margaret McNulty spoke at St Peter in Chains, Blackburn on the Sunday morning. Angela McKay spoke at St John Vianney, Blackburn at Saturday night and Sunday morning Masses. Margaret and Angela had consulted over their script and agreed to ask people to take out their mobile ‘phones and insert the National Slavery Helpline number there and then. This had some success but with mobiles turned off not everybody managed at the time. Hopefully it would be a spur for them to do it later. If this exercise were repeated parishioners could be asked to turn their ‘phones on at the start of the talk but keep them on silent. Day for Life is the day in the Church’s year dedicated to raising awareness about the meaning and value of human life at every stage and in every condition. The Church teaches that life is to be nurtured from conception to natural death. 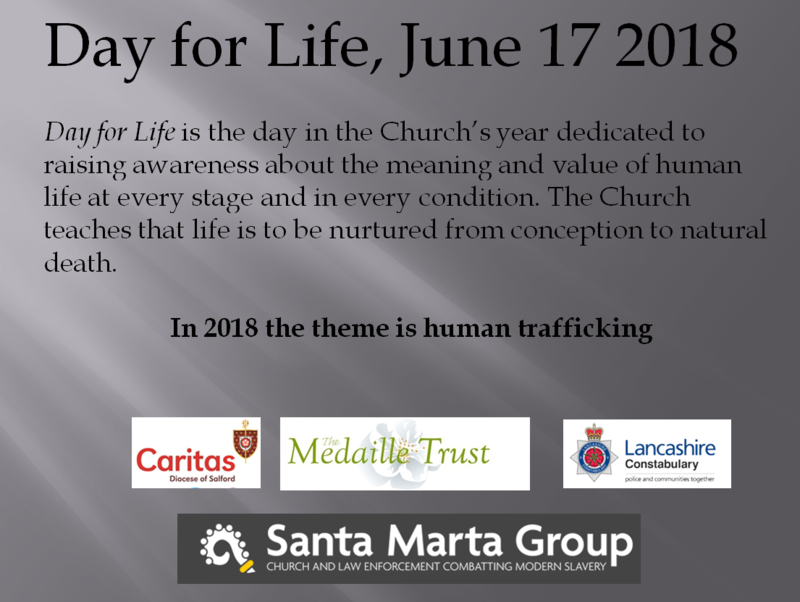 This year’s Day for Life is celebrated on 17 June in England and Wales and the theme is human trafficking. The previous weekend and into Monday we packaged and posted posters, “signs” cards, Medaille prayer cards and a covering letter from Mark Wiggin, Caritas Salford, to 132 parishes in the Diocese. We hoped the meetings, newssheets and other communications would encourage priests to ensure that every parishioner received a card. 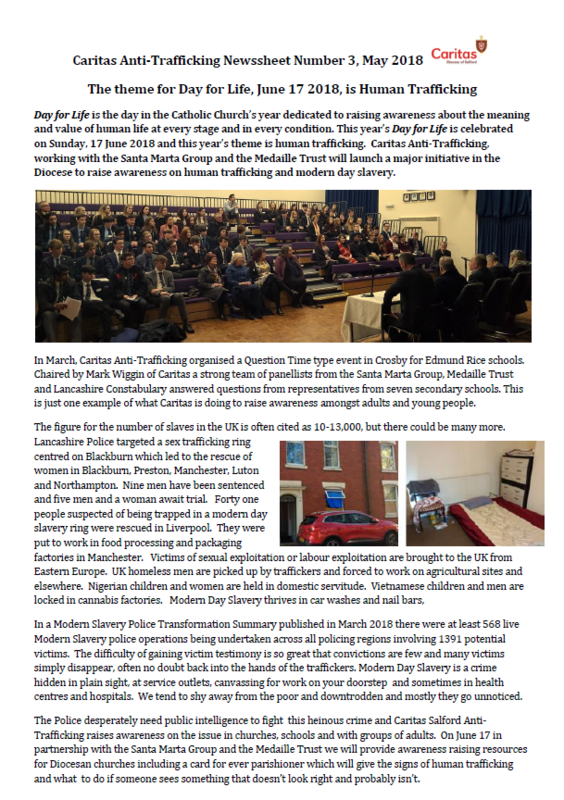 The newssheet, which is part of the build up to the Day for Life (Theme: Human Trafficking) June 17, is below. Click to get a full size pdf version. Thank you to Fr Philip Brady for the invitation to speak and share lunch at his deanery meeting. We had 45 minutes on the issue of human trafficking and the Day for Life, June 17, awareness raising launch, with questions and answers, followed by an excellent lunch by the Presentation Sisters at the Presentation Convent. Meeting to go through the detailed plan for Day for Life, June 17. We learned that as well as our own materials within Salford Diocese there will be a letter to parish priests from Bishop John Sherrington, Auxiliary Bishop of Westminster, along with A5 leaflets for parishioners. 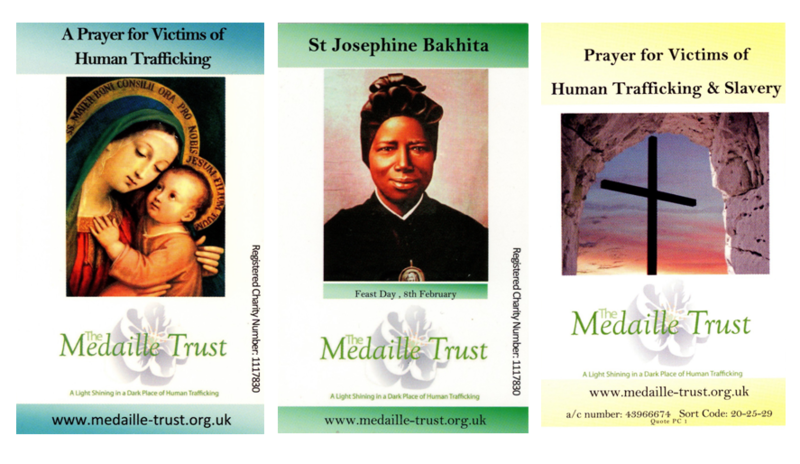 Over the last few days we have posted out copies of the Easter edition of the Medaille Newsletter to all churches in Salford Diocese, in order to raise the profile of the Medaille Trust’s work in the build up to Day for Life. Meeting to discuss our diocesan awareness raising launch on Day for Life June 17. Fr Brady invited Anthony Brown to come to his deanery meeting and lunch to talk to the deanery priests on May 15. Thank you to Canon Paul Brindle for the invitation to speak and share lunch at his deanery meeting. After a 15 or 20 minute presentation on human trafficking and the Day for Life, June 17, awareness raising launch, it was good to talk informally over a good meal. Meeting to discuss our diocesan awareness raising launch on Day for Life June 17. Fr Paul invited Anthony Brown to come to his deanery meeting and lunch to talk to the deanery priests on February 20. Meeting to discuss our diocesan awareness raising launch on Day for Life June 17. Fr Kevin invited Mary and Anthony Brown to come to his deanery meeting and lunch to talk to the deanery priests on March 20. 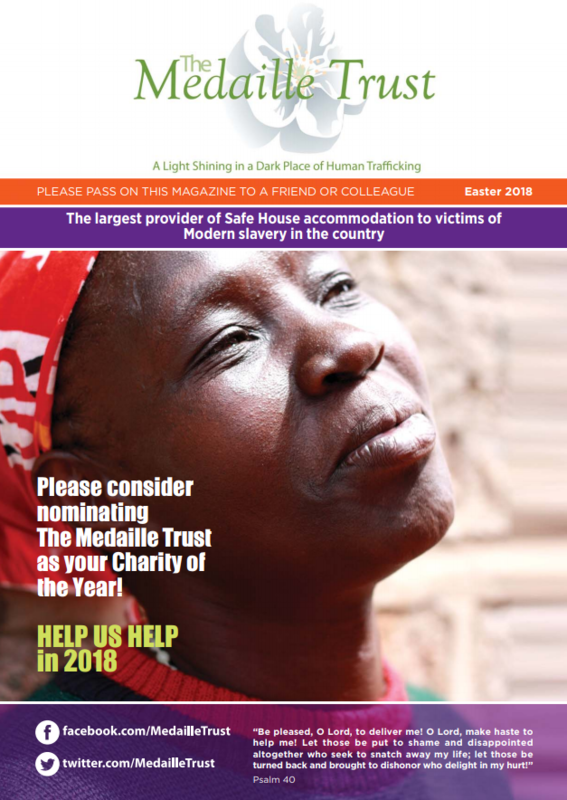 This newsletter went out just prior to the feast day of St Bakhita on February 8 but is the start of a diocesan wide awareness raising initiative which will focus initially on June 17, the Day for Life. 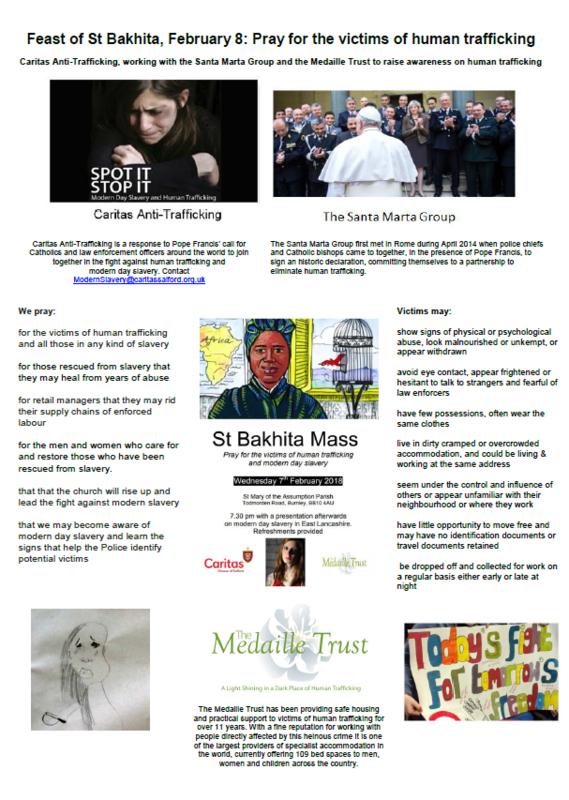 The newsletter went to all churches and all schools in the diocese. Click on the picture to get a full size pdf version. Meeting to discuss our diocesan awareness raising launch on Day for Life June 17. Fr Phil had a number of interesting ideas on materials and media we intend to use which we will take to our next meeting with the SMG. This was the first of six meetings with deans to discuss our diocesan awareness raising launch on June 17. This was a useful informal meeting at Costa Coffee with Fr Peter who is Dean of St John Vianney Deanery and would be attending the Council of Deans meeting on the 14th. We briefed him on our planned Diocesan awareness raising launch on the Day for Life (June 17 2018) so he could give the deans an update. This was a follow on to the November 8 meeting in which we extended our aspirations to include all eight Salford deaneries in a larger exercise with a remit beyond the earlier one. Anthony Brown reflected on the efforts and energy required to engage people at parish level. His strategy has been to make small incremental gains in awareness raising concentrating on individuals and extending his network of concerned individuals. 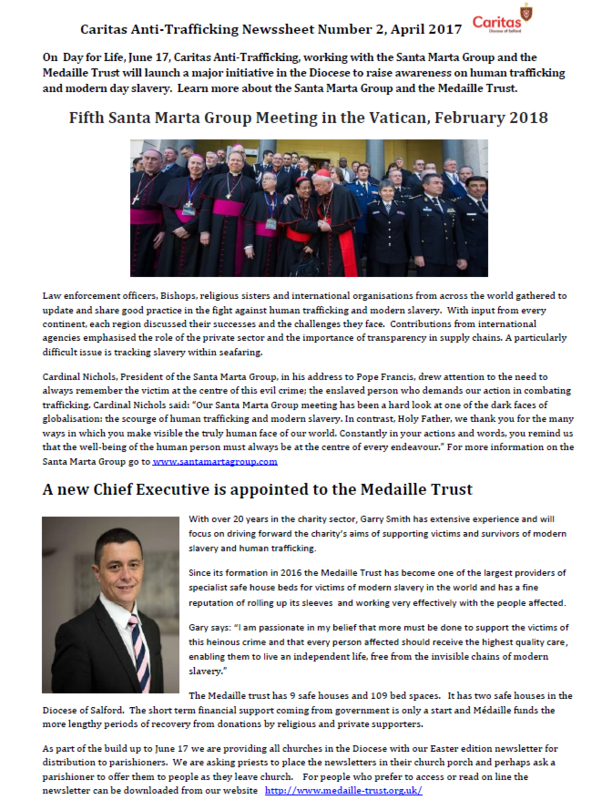 He proposed a diocese wide awareness raising initiative which would be a joint Caritas, SMG, Medaille Trust effort with funding support from all for materials and staff. Mick Wiggin emphasised the need to constantly engage the audience and acknowledged that energy and strategy needed to create traction in the diocese on the subject of trafficking/modern day slavery. Getting the diocesan clergy on board is essential and we expect Bishop Pat Lynch will do a pastoral letter for 17th June (Day for Life) which would be a good day for the launch of a diocesan wide awareness raising initiative in all parishes. Mark supported the idea that SMG branding was essential to feel part of a bigger global movement. Phoebe Prendergast offered links to other dioceses and noted national awareness opportunities such as the Feast of St Bakhita on 8th February. SMG are developing resources for awareness raising and prayer and will use the SMG website and social media to good effect. Follow up after a launch is critical to maintain momentum. All agreed on the need for a resourced strategy that could eventually include a part time diocese coordinator.